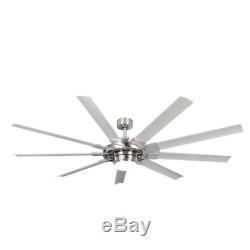 Fanimation Studio Collection Slinger v2 72-in Brushed Nickel LED Indoor/Outdoor Ceiling Fan with Light Kit and Remote (9-Blade) ENERGY STAR. Add sleek, modern style to your kitchen or covered porch with this brushed nickel ceiling fan from the Slinger V2 collection. 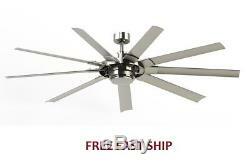 Its nine brushed nickel finish blades feature a high-fashion rectangular shape that adds unique style to your home. Six energy-efficient speed settings, plus a reverse air flow feature, make it easy to maintain the ideal comfort level all year long, and the remote control allows you to operate the fan and light from anywhere in the room. 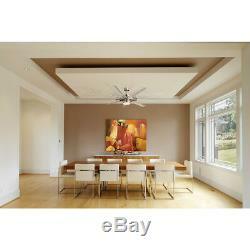 6-in down rod included - mounts to flat ceiling and sloped ceiling. 6 energy-efficient speed settings make it easy to maintain the ideal comfort level. Remote control with seasonal reverse feature allows you to operate fan and dimmable light from anywhere in the room. Damp rated for outdoor use under covered porches or patios. Great for modern style decor. To ensure proper installation, please follow remote control programming instructions and make sure that the wall switch that controls the power to the fan is a true on/off toggle or rocker switch - wall dimmers will cause the fan to not function properly. 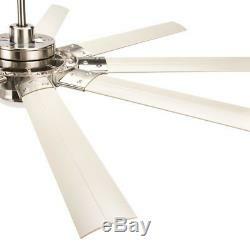 The item "72 Brushed Nickel Downrod Mount Indoor/Outdoor Ceiling Fan LED Light and Remote" is in sale since Friday, December 21, 2018. 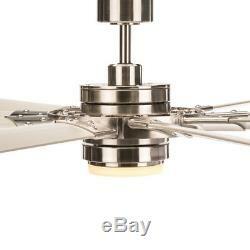 This item is in the category "Home & Garden\Lamps, Lighting & Ceiling Fans\Ceiling Fans". The seller is "sullenestdiscounttools" and is located in Nottingham, Maryland. This item can be shipped to United States, Canada, United Kingdom, Denmark, Romania, Slovakia, Bulgaria, Czech republic, Finland, Hungary, Latvia, Lithuania, Malta, Estonia, Australia, Greece, Portugal, Cyprus, Slovenia, Japan, Sweden, South Korea, Taiwan, South africa, Thailand, Belgium, France, Hong Kong, Ireland, Netherlands, Poland, Spain, Italy, Germany, Austria, Bahamas, Israel, Mexico, New Zealand, Philippines, Singapore, Switzerland, Norway, Saudi arabia, United arab emirates, Qatar, Kuwait, Bahrain, Croatia, Malaysia, Brazil, Chile, Colombia, Costa rica, Panama, Viet nam.